Mark your calendars for Feb. 9, 2019 at 1:00 P.M.. This is the date and time for the repeaters annual meeting to be held at the South Bay fire station. All are welcome to attend. Come and hear what is new and what may be on the horizon. 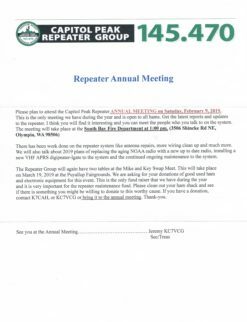 If you have ideas on how to make the repeater better or have something you would like to see on the repeater bring those ideas with you If you are not a member of the repeater group forms will be available to fill out to join. More information will be forth coming. So stay tuned. Members should have received a mailing like the one posted below. Welcome to the 145.47 repeater. This repeater is located on CAPITOL PEAK at 2700 feet, approximately 15 miles south west of Olympia, Washington. 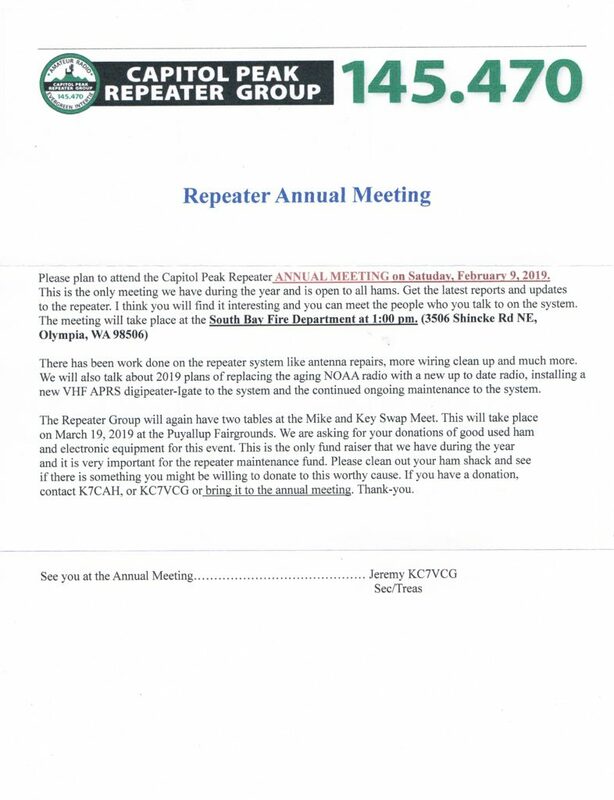 The repeater call is K7CPR and is operated by the CAPITOL PEAK REPEATER GROUP, a non-profit tax deductible corporation under section 501(c)(3). All donations of cash or property can be treated as a charitable contribution on a Federal Income Tax Return.